Out at sea, gentle waves provide power for thousands of homes. In cities, dancefloor moves generate electricity for nightclubs. In the countryside, hikers use leg power to recharge their phones. Researchers at the Georgia Institute of Technology said they had built a simple prototype device that converts stop-start movement into power. Waves, walking and dancing—even rainfall, computer keys or urban traffic—could one day be harnessed to drive sensors, mobile gadgets or even electricity plants, they contend. Zhong Lin Wang, a professor of materials science and engineering, described the invention a "breakthrough." "Our technology can be used for large-scale energy harvesting, so that the energy we have wasted for centuries will be useful," he told AFP by email. "Tribo-electric" is a modern term with ancient roots—from the Greek word for "rub." Its electricity is created from friction between two substances causing a charge of electrons to be transferred from one to the other. It commonly happens, for instance, when plastic-soled shoes are in contact with a nylon carpet, causing the snap of static discharge when one's hand touches a metal doorknob. Because tribo-electric is so unpredictable, it has been generally shunned as a power source. The preferred method has been magnetic induction—a turbine driven by nuclear- or fossil-powered steam or water. But, in a new study published in the journal Nature Communications, Wang's team said they had overcome key hurdles to converting a haphazardly-generated electrical charge into current. 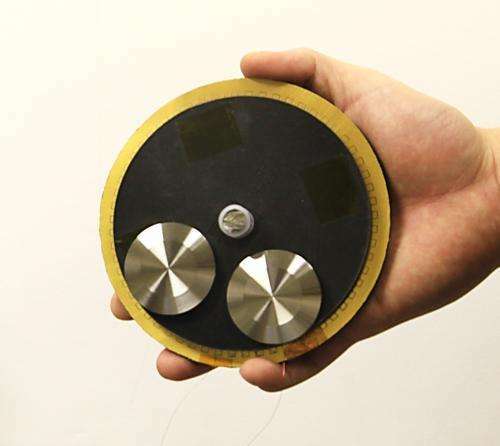 Their prototype comprises a disc about 10 centimetres (four inches) across, designed to show the potential from a small, portable generator moved by ambient energy. 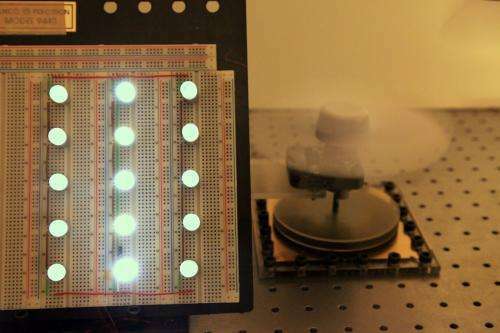 Inside are two circular sheets of material, one an electron "donor" and the other an electron "receiver," brought together through rotary movement. If the sheets are separated, one then holds an electrical charge isolated by the gap between them. Sandwiched between the two discs is a third disc with electrodes, which bridges the gap and helps a small current to flow. At a top speed of 3,000 revolutions per minute, the device generated 1.5 watts. This gave it an energy efficiency of 24 percent, three times greater than piezoelectric, the previously best source of mechanical electricity harvesting—and as efficient as magnetic-induction turbines. It can run on a gentle wind or tap water, or "random jerky motions," including human movement, to provide the rotation, Wang said. "As long as there is mechanical action, there is power that can be generated." 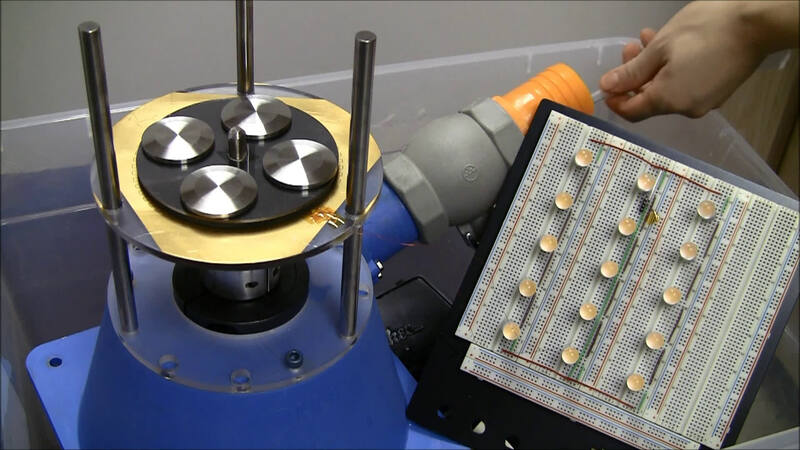 The prototype used copper for the rotator and gold for the electrodes in lab tests, but these could easily be substituted for low-cost synthetics, he said. The team is working on ways to scale up tribo-electric energy for harvesting power from the ocean. 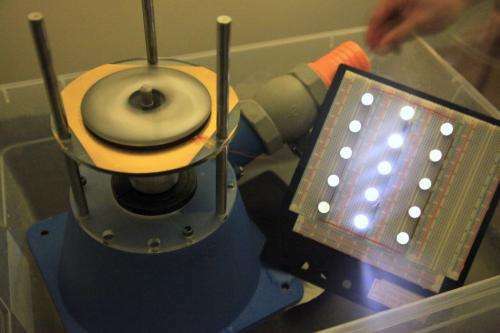 "This gave it an energy efficiency of 24 percent, three times greater than piezoelectric, the previously best source of mechanical electricity harvesting—and as efficient as magnetic-induction turbines." It is an interesting device that may serve a purpose but I cannot see it producing kilowatts of power in any normal application. It is obvious to me that these articles are written to fulfill government grant requirements. They received a grant to research renewable energy devices and that is how the device is presented. the "sustainable dance floor" a project between Club Watt (nightclub in Rotterdam) and the university of Delft in 2008 showed that each person on the dancefloor is capable of generating 20W/h. So for every 1000 people "in da club" that's a pretty nice 20Kwh! Pity that this dance floor never existed... in your alternative universe at least, in mine you can buy one of these if you have enough cash. Enric if you really think that producing energy from people walking or dancing can supply useful energy to the grid you are delusional. They will just get tired that much sooner. The same goes for generators in roads, all you will do is decrease the vehicles gas mileage by more than any energy produced. Conventional generators are more efficient at producing power from wave or tide action. I would like to see cheap renewable energy as much as anyone but I get really angry when people try to tell me that a device can do something that that is not practical. Smack a Tesla Turbine on this. This look like a modern improved version of very old electricity made by cat skin on glass or any other things . There is two steps, charge difference creation which gives a constant current generator and after sliding charge separation mechanical work made against electrostatic forces between opposite charges, which can be large giving very high voltage like Van de Graaff generator if the current is large. The reported efficiency seems a real breaktrough able to make an industrial revolution. based on pyramid-patterned PDMS thin film. It is not cear how fast is the friction wearing out, which must be very slow ??? It must resist many billion of fast tribo friction charge separations with no degradation ????. I see this device as useful in small niche applications but it can hardly revolutionize power generation. I cannot see someone using this sort of generator to charge a personal device other than in emergencies. Also, most static generators are very sensitive to moisture so the device will have very tough packaging requirements. Wonderful indeed! Just a bit more and we will catch up with the past! Those geometric figures on the Nazca plain, walkers recharging the energy pits!! The ley lines in Britian, again sources of electrical energy lost to us the egotistical futurists. Of course, this was applicable during one of the long delay magnetic reversals of the sun. Just imagine, the magnetic field Earth was imbued inside held up the water veil, and allowed the smarter us to exist on mountain tops exposed to cosmic radiation. While down below the rest of us existed in the moment like dogs (who don't have it so bad after all). Now that we are the same, all of us capable of future planning but not it seems understanding the past, we compete daily for the benefit of none. They should embed something like this in speed breakers.